While the general condition of prisons and the prisoners is pathetic, those suffering disability is horrific to say the least. The basic right to life ( Article 21 of the constitution) is mostly violated in dealing with prisoners who are handicapped. The Veena Sethi case in the early 1980s brought to light the treatment of persons with mental illnesses and their prolonged incarceration ranging from 16 to 30 years in custody ( The rights of prisoners with disabilities, by Kalpana Kannabhiran, update October 18, 2016, thehindu.com). This case highlighted the importance of addressing the conditions of disabled prisoners and the lack of accessories and support needed to them for their daily living. India is committed to the UN Convention on the Rights of Persons with Disabilities ( UNCRPD). Article 4(d) enjoins States Parties ” to refrain from engaging in any act or practice that is inconsistent with the present Convention and to ensure that public authorities and institutions act in conformity with the present Convention” . In relation to State custody of persons with disabilities, Article 15(1) of UNCRPD states, ” No one shall be subjected to torture or to cruel, inhuman or degrading treatment or punish- ment”. Article 15(2) places an obligation on states to protect disabled persons from cruel, degrading or inhuman punishment or treatment. Explaining the nightmarish situation of disabled prisoners, Toshio Meronek in an article ( The Invisible Punishment of Prisoners with Disabilities, July 23, 2013, thenation.com) says that unless changes are brought about, the disabled prisoners would be subjected to worse excesses of the prison system. The article elaborates struggles of about 100 mentally disabled prisoners in Santa Rita Jail, Alameda County, California Ricky Thomas was denied medical and physical access for years. The American Civil Liberties Union(ACLU) has been exposing the violations by authorities of Americans with Disabilities Act. Similar is the case with Prof. G. N. Saibaba. 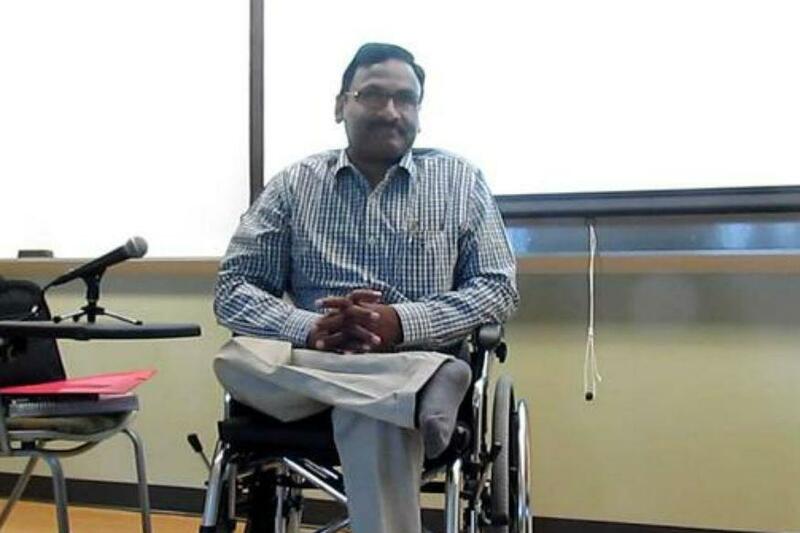 In a post on his condition in jail ( Health deterioration of Prof G N Saibaba in Anda cell, by A S Vasantha Kumari, January 29, 2019, posted in kracktivist.org), the inhuman treatment can be palpably seen. When his wife saw him through the barred glass panes of mulakat window on December 26, 2018 according to court orders, she could find his health worsen beyond imagination. He could not almost move and his hands shivered and he developed many other problems besides the usual diseases. Even the time allocated for conducting tests was insufficient. Since almost two years, the case is dragging without any sight of relief. His rights are being severely curbed and the illegal incarceration continues with solitary confinement in the jail. Let alone justice, even the cells in which disabled persons are lodged do not have basic facilities like ventilation, toilets and hygienic food, etc. Tony Goodman, a wheel- chair bound paraplegic, inmate at the Georgia state prison, in a 1999 suit, claimed discrimination under Title II of the Americans with Disabilities Act ( Disabled and in Jail: The Disability Rights of Prisoners by Ellen Rosner Feig, legalzoom.com). After struggles in lower courts, the Supreme Court gave some relief by agreeing for better access to basic facilities in prisons. In India too, many handicapped languishing in jails should be granted at least minimum facilities for smooth conduct of their daily requirements. According to a study ( Disabilities among prison and Jail inmates 2011 – 2012, Jennifer Bronson and Laura. M. Maruschak, December 14, 2015, bjs.gov), an estimated 32% of prisoners and 40% of jail inmates reported disability according to National Inmate Survey (NIS-3) and female prisoners are more likely to report cognitive disability in America. In India too, many disabled prisoners are facing harsh condition with lack of sympathy from jail officials. Most of them are incarcerated for years without trials. The court should address problems of disabled and persons like Saibaba should be given facilities to discharge their day – to- day needs. The bail application should be heard by Court at the earliest. Able-bodied citizens and citizens with disabilities need to be made equal partners in our nation-building mission.